Hyundai has announced pricing and specs for the i30 N, the first performance car under its new N sub-brand. On sale from 4 January, the i30 N will be available in both i30 N and i30 N Performance specifications. Powered by a 247bhp turbocharged 2.0-litre engine, the base model is priced from £24,995 OTR and brings equipment including 18-inch alloys with Michelin Pilot Super Sport tyres, electronically controlled suspension, torque vectoring and steering wheel mounted Drive Mode Buttons as well as Smart Adaptive Speed Control, Keyless Entry with Engine Start/Stop Button, 8-inch touchscreen with sat nav and Android Auto and Apple Car Play. 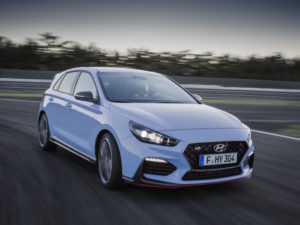 The i30 N Performance is priced from £27,995 OTR and gets a 271bhp version of the same engine along with 19-inch alloys with Pirelli P-Zero tyres, Electronical Limited Slip Differential and 18-inch ventilated front brake discs with 17-inch rear. It also features leather and suede seats with electrical operation on the driver’s and passenger’s seats, and Active Variable Exhaust System.For more of the latest industry news, click here.